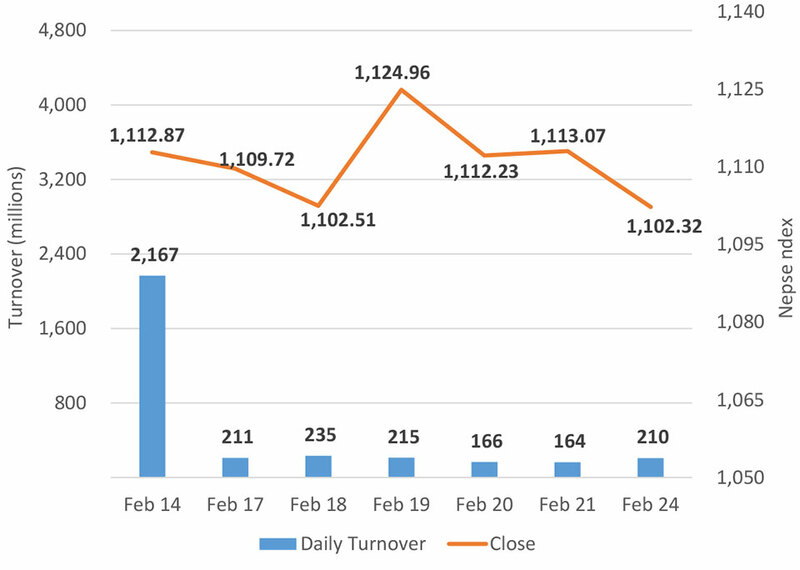 KATHMANDU, Feb 25: Stocks showed some strength in the initial trading on Sunday. However, the Nepal Stock Exchange (Nepse) index erased its morning gains to trade in red for the remaining trading hours. Steady decline among the traded stocks saw the benchmark index tumble 10.75 points to close the day 1,102.32 points. The index, which closed marginally higher on Thursday, reverted to its losing ways as the market continued to experience sustained selling pressure. Investors appeared cynical while trading in the secondary market amid lack of any major impetus in the bourse. The exchange recorded another dreary session as only Rs 210 million worth of shares changed hands on Sunday. 1.67 percent, closed the day in red. 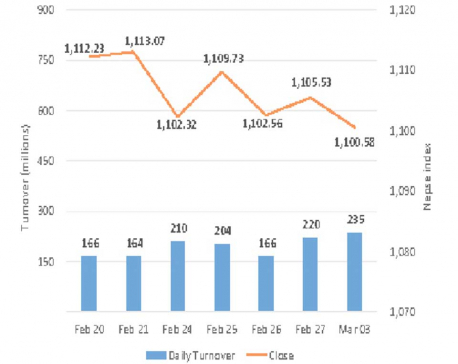 'Others' sub-index logged loss of 1.55 percent followed by Microfinance sub-index which saw its sub-index go down by 1.48 percent. Insurance stocks also suffered as reflected by drops of over 1 percent in Non-Life and Life Insurance sub-indices. Similarly, Hotels, Banking and Hydropower segments also closed the day in red. Banking scrips led the list of active stocks. NIC Asia Ltd led the list of companies in terms of transaction amount as over Rs 13 million of the commercial bank's shares changed hands. Nabil Bank was next on the list with transactions worth Rs 12 million. Other active stocks of the day include Shikhar Insurance Company Ltd, Chautari Laghubitta Bittiya Sanstha Ltd, Upper Tamakoshi Hydropower Ltd and Nepal Bank Ltd with transactions of over Rs 10 million each. Among gaining scrips, Unilever Nepal Ltd posted the highest gains of 4.03 percent, erasing some of its losses since January. Similarly, share price of Excel Development Bank Ltd jumped up by almost 4 percent. Next on the list was NMB Hybrid Fund L-1 whose unit price went up by over 3 percent. Shine Resunga Development Bank Ltd, Citizens Mutual Fund-1 and Radhi Bidyut Company Ltd were among other gainers which added 2 percent on their respective unit prices. On the other hand, Kisan Microfinance Bittiya Sanstha Ltd recorded worst performance of the day as its share price tanked by over 7 percent. Bhargav Bikash Bank Ltd and Support Microfinance Bittiya Sanstha Ltd followed suit with their share prices going down by over 6 percent each. Share price of the recently-listed Ghalemdi Hydro Ltd also closed around 5 percent lower. Similarly, Womi Microfinance Bittiya Sanstha Ltd, Oriental Hotels Ltd and Khanikhola Hydropower Company Ltd logged losses of over 4 percent each. On news front, Life Insurance Corporation Nepal Ltd is holding its Annual General Meeting (AGM) on March 18. The life insurer has proposed to provide 12 percent stock dividend to its shareholders. As per the ARKS technical analysis, the index formed a bearish candlestick on a daily timeframe. With the day's losses, the index has returned back to 1,102 points for a second time in a week and is likely to test the psychological level of 1,100 points. With technical indicators suggesting bearish momentum prevailing, a breach of 1,100 points to the downside might see the index stretch its downtrend further.